Read the tips below and consider which egg incubator is right for you! A set-and-forget egg incubator does not exist. Even the most advanced egg incubators need hands-on work such as daily observation of temperature and candling of eggs. There is no “best” egg incubator for all situations as what is the “best” for you may not suit another. 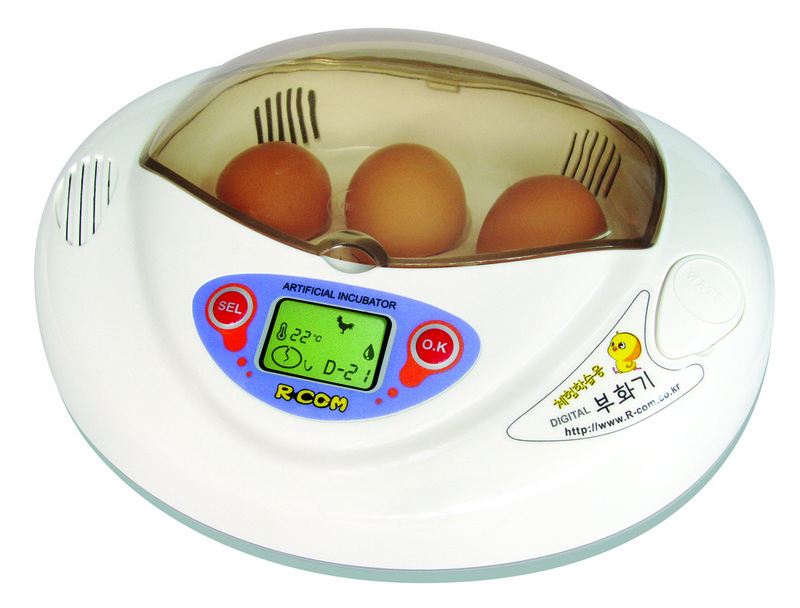 Egg incubator hatch rate is determined by factors including quality of fertile eggs, user experience, breeder bird’s diet, egg storage and handling conditions, breeder genetics and more. How many eggs would you like to incubate at a time? Are the appropriate egg size trays available i.e. quail, duck? 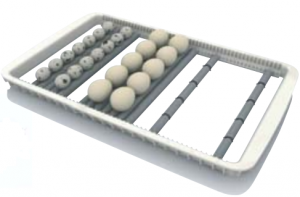 How many eggs you need your incubator to hold will narrow the range of incubators to one or two that will be suitable. From there, make a decision based on your budget, which will need to be considered against the incubators bells-and-whistles. 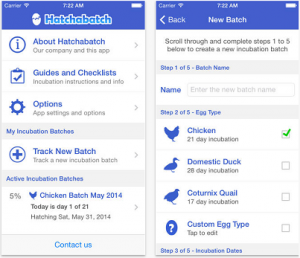 How much do you want your egg incubator to do for you? As it says at the beginning, there is no such thing as a set-and-forget incubator, but you can get a considerable amount of extra features as the price increases. The more you are willing to spend, the more the incubator will do for you. That said, you will learn a lot more about the incubation process the more hands on you are. As an example, let’s say you want to buy an incubator for 15 eggs. The options available are an Rcom King Suro, and Rcom 20 Standard, an Rcom 20 Pro or a Bellsouth 100 (auto, semi-auto or manual) or Lyon TX which vary on the price scale. 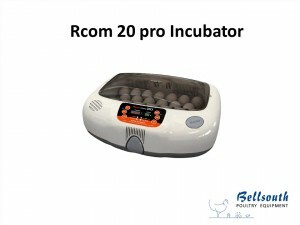 If you have a larger budget and want the incubator to be able to do quail and duck eggs as well then the Rcom 20 Pro is probably the best bet as it has settings for the different breeds that can be programmed and saved and has fully automatic turning. If you want the same capabilities but have a small budget, then a Bellsouth 100 manual is just over a quarter of the price and will also be able to do any of those breeds but will require a lot more observation and work turning the eggs and maintaining good humidity. 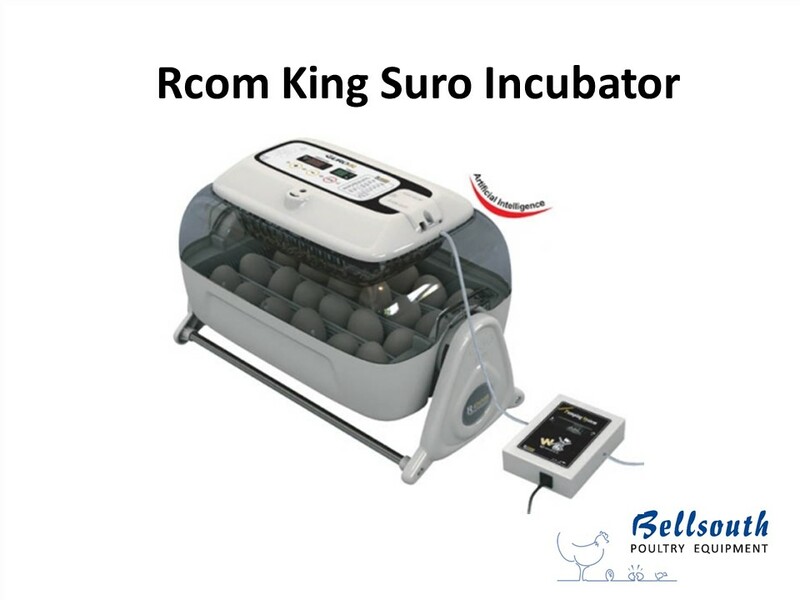 If you had a modest budget but only wanted to do chicken eggs then an Rcom King Suro might be your best option. Check out our eshop for incubator details and pricing. What are the differences between an Rcom 20 or 50 and Bellsouth 100 incubator? Selecting the right machine will depend on what you need and your budget. Rcom use fans to distribute heat and humidity around the incubator whereas the Bellsouth 100 incubator is a still air which mimics the hen sitting on eggs. The thermostat probe sits above the egg to regulate heat and create a thermal gradient. Rcom 20 hold up to 20 chicken eggs whereas Rcom 50 holds up to 50 chicken eggs. Bellsouth 100 manual version holds up to 100 chicken eggs. The Bellsouth semi-automatic and automatic holds up to 48 chicken eggs. Manual, semi-automatic or automatic turning? Rcom has automatic turning only.The Bellsouth 100 comes as a manual turn, semi-auto or automatic turning. Rcom 20 and 50 standard have universal trays and will take small eggs and up to turkey size (not emu or ostrich). 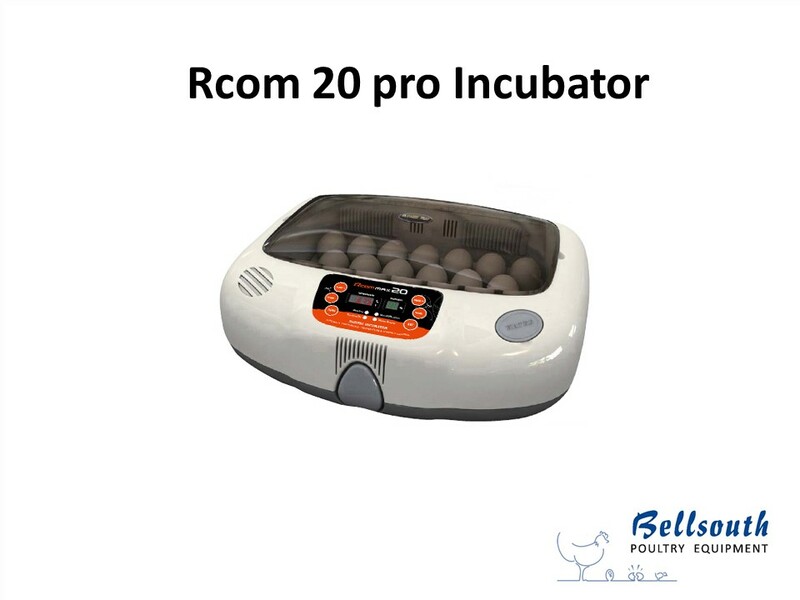 The Rcom Pro incubators come with moulded egg trays (chicken, duck and quail only). The Bellsouth 100 automatic incubator has a tray with dividers and will take small eggs, up to turkey size (not emu or ostrich). One species of egg can be incubated at a time due to the probe sitting at the common height of the egg. Where will the incubator be housed? 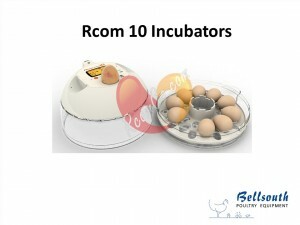 Ideally use an insulated, incubation room 15 degrees C or above for any egg incubator. 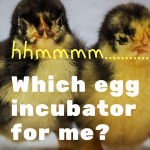 How do you want the incubator to operate? Rcom 20 or 50 have push button (Standard MX version) or main menu driven (Pro version) with visual display. Whereas the Bellsouth has an adjustable temperature rod left or right to adjust incubator temperature. Wait to see adjustment on spirit thermometer to check adjustment in temperature is suitable. Do you want visual, digital menu displays or simply manual viewing? Rcom incubators have digital displays with temperature and humidity readings. The Bellsouth 100 incubator requires a visual check of supplied spirit thermometer to check temperature. Nil humidity display. Candle eggs to track humidity accuracy for all incubators. • Includes a hatch tray to assist with keeping the turning rollers clean. Economic edition. Innovative design, easy to use manual turning. Egg tray supplied, thermometer supplied, turning disk supplied. • Rcom 10 Pro – automatic turning, digital display temperature and manual humidity. Moulded egg tray supplied. Candler inbuilt. • Rcom 10 Pro Plus – automatic turning, digital display temperature and automatic humidity. Moulded egg tray supplied. Candler inbuilt. This is the budget model of the Rcom 20 egg incubator as there is assembly required when it comes out of the box. Assembly involves screwing the rods onto the rocking cradle and attaching the humidity pump. Unlike the Rcom 3, 10 or 20, the King Suro 20 will hold your eggs vertically between universal dividers, during incubation for maximising space whilst turning your eggs. So your eggs rock – not roll. The eggs are gently turned on a rocking cradle. Take the main body of the incubator off the rocking cradle three days before hatch. • The external humidity pump means you can put the silicone tubing into an extra-large water container when you are going away for a long weekend. Does not have a countdown feature nor does it automatically switch off turning 3 days before hatch. The King Suro incubator base fits the King Suro Eco hatcher for seamless transfer of eggs. The Rcom 20 MX or standard series come with an adjustable tray or universal dividers. Adjustable trays can cause egg migration, where the eggs tent to “walk “up and down the grids. Place same egg ends together i.e. pointy ends together and round ends together. The Rcom 20 Pro come with pre-moulded egg trays for 48 quail eggs, 20 chicken eggs and 10 duck eggs. • Rcom 20 Pro has programmable turning control which allows you to program when auto turning ceases automatically three days before hatch. 1/ The first chicks to hatch will walk all over the other eggs, knocking them around, and soiling them with hatch residue. This enables cross contamination of the eggs. 2/ The eggs due to hatch should not be turned, and the eggs which still need incubation should still be turned. Also, opening the incubator to turn the eggs during hatch is a significant problem for the chicks just hatching, so it cannot be recommended. Not turning the eggs which have a long period still to incubate is not good for those eggs, so they are compromised as well. So not a good idea unless you have another incubator, and transfer the eggs out to hatch in a separate machine. I have parrot or specialty eggs and wish to incubate some and hatch others in the Rcom 20 Pro incubator at once? Yes, you can purchase an optional roller assembly for your Rcom 20 Pro and Rcom 50 Pro or the rollers only for the Rcom 20 MX (standard) and Rcom 50 MX (standard). As with all electronics, incubators are susceptible to power surges and lightning strikes. These are difficult to guard against and standard household surge suppressors are not ideal for containing large and long power surges. We recommend the use of computer UPS power supplies for those in areas where power supplies are unstable or have frequent short shutdowns. The problem with these situations is that the return of power is often accompanied by a period of high voltage, and this can be detrimental to the power supply in the incubator. UPS systems are available from all computer stores and large retailers. In recent times the widespread use of computers has caused a great reduction in the price of these units so the security is worthwhile, especially with rare eggs. 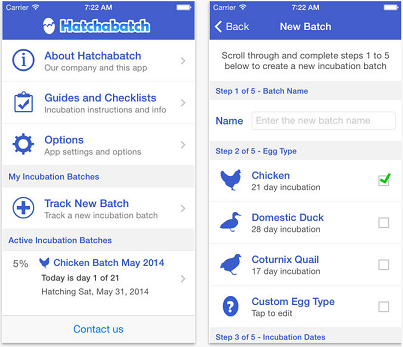 Want to know more about incubation or track hatching – download Hatchabatch in Google Play or Hatchabatch in iTunes.